The tobacco industry’s global efforts to use bilateral and multilateral agreements to challenge the spread of tobacco control measures such as trademark-minimising plain packages were dealt a significant blow last week when the World Bank dispute settlement body dismissed a case brought by Philip Morris against the government of Uruguay. The decision is seen a landmark for those who view the company as using test cases to continually challenge and delay public health protection measures and discourage other countries, particularly those with fewer resources, from strengthening their health regulations. Additionally, the case reasserted that trademarks are subject to government regulations and also illustrated the role that international organisations and actors can play in support of national governments defending their health measures. Philip Morris initiated legal proceedings through its Swiss subsidiary against Uruguay at the World Bank’s International Centre for Settlement of Investment Disputes (ICSID) early in 2010. Among many firsts, this was the first time a tobacco group challenged a state in front of an international court and the first investment arbitration concerning tobacco control. ICSID aims to support voluntary conciliation and arbitration of international investment disputes upon consent of both the investor and state. Once such consent is given, it cannot be withdrawn unilaterally and it becomes a binding undertaking. Independent arbitrators and conciliators appointed to each case hear the evidence and determine the outcome of the dispute. Philip Morris claimed that the health measures imposed by the Uruguayan Public Health Ministry infringed on its intellectual property rights and breached Uruguay’s obligation under the bilateral investment treaty (BIT) between itself and Switzerland. The case and related documents can be found here. Two specific measures were contested. The first was the Single Presentation Requirement introduced by the Uruguayan Public Health Ministry in 2008, where tobacco manufacturers could no longer sell multiple varieties of a brand. In having to pull 7 out of its 12 products, Philip Morris alleged that only being able to market one variety substantially affected its company value. The second measure concerned the so-called “80/80 Regulation.” Under a presidential decree issued in 2009, the graphic health warnings on cigarette packages should cover 80 percent instead of 50 percent, of the packaging, leaving only 20 percent to the tobacco companies’ trademarks and other information. Uruguay was the first to go beyond the 50 percent surface requirement, but since the proceedings began, 58 other countries have also increased the requirement for the size of graphics. Nepal even calling for 90 percent of a cigarette package to be covered. The claimants contended that this further deprived them of their IP rights, causing further loss to their investments. The case moved to examine whether Uruguay had failed to observe its commitments on the use of trademarks under the BIT and the scope of such commitments. Upon submitting a registration application and being granted trademarks, Philip Morris argued that an investor should be able to hold and exercise the full range of rights available to trademark holders and that Uruguay would be committed observe these rights. Within these rights was notably the right to use its trademarks. This reflects and falls in line with the general concept that trademarks confer their holders only the right to prevent others from using their marks and are still subject to state regulations. Furthermore, with regard to the scope of commitments, it was held that “a trademark is not a unique commitment agreed in order to encourage or permit a specific investment” and that Uruguay had no commitment nor obligation in relation to an investment under the BIT. Ultimately, “a trademark gives rise to rights, but their extent, being subject to the applicable law, is liable to changes” subject to a state’s decided health measures. With no commitment to enable Philip Morris to use its trademark and with trademarks being subject to national laws and regulations, the tribunal found that Uruguay had not violated the BIT and dismissed the case. The case is highly significant given the polarity between actors and the debate on the use and application of domestic and international intellectual property laws. Many hail this case as a significant victory in a series of tobacco companies fighting control measures, and others such as former New York Mayor Michael Bloomberg applauded Uruguay for standing up to the tobacco industry and showing others they can win. The decision reinforces that states have a sovereign right to decide on their laws and regulations to protect their population. Philip Morris General Counsel Marc Firestone, meanwhile, said the company “never questioned Uruguay’s authority to protect public health,” but sought to clarify international law. Some critics, such as Laurent Huber, executive director for Action on Smoking and Health, contend that this was a public relations case for Philip Morris, aimed at discouraging other countries from imposing stronger public health regulations with the threat of a lengthy lawsuit by an opponent with deep resources. The annual revenue of Philip Morris in 2013 was reported at $80.2 billion, in contrast to Uruguay’s GDP of $55.7 billion. The Bloomberg Foundation lent substantial financial support to Uruguay’s legal expenses. Overall, given the definitive outcome of the present case in addition to cases where domestic, regional and international courts upheld measures to impose plain packaging and new tobacco regulations (see United Kingdom, European Union and Australia), other countries will perhaps no longer feel pressured and act on their own accord with regards to strengthening their public health measures. 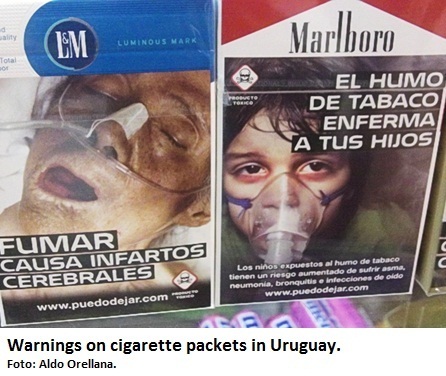 Another significant aspect of the case is that the World Health Organization and the WHO Framework Convention on Tobacco Control (WHO FCTC) secretariat submitted an amicus brief during the proceedings which provided “public health on Uruguay’s tobacco packaging and labelling laws and detailed state practice in implementing similar measures.” Further details can be found in the WHO’s press release. This is not only affirmative that the FCTC provides legal backing to states who seek to provide protective health measures, but illustrates the success of international organisations in supporting national governments in their health efforts. Lastly, in view of the place of arbitration some might question the existence of investor-state dispute settlement bodies such as the ICSID. Hansen-Kuhn argued that rather than allowing investor-state dispute settlement bodies to decide, global governance rules should be given priority to lead the way on public health discussions. Alexandra Nightingale is an intern at Intellectual Property Watch. She completed her Bachelors in Law at the University of Sussex and holds an LLM degree in International Law from the School of Oriental and African Studies in London. During her Masters, she developed a strong interest in Intellectual Property, particularly patents and the aspects relating to global health. Her research interests now also include geographical indications and trademarks. Alexandra Nightingale may be reached at info@ip-watch.ch. "The Significance Of Uruguay’s Win Over Philip Morris International" by Intellectual Property Watch is licensed under a Creative Commons Attribution-NonCommercial-ShareAlike 4.0 International License. The case of win for Uruguay is a classical example of terrorizing and brow- beating small effective nations from taking effective tobacco control legal steps. Had the Uruguay lost this battle, other smaller countries would have had badly shaken confidence in starting any legal battle against Tobacco Multinationals. This case exemplifies solid support of Tobacco control fraternity to smaller nations with meagre technical and financial resources as compared to Tobacco Industry. Kudos to Michael Bloomberg and the WHO .